Although eating disorders can potentially affect as many men as women, it is women who are the most commonly diagnosed group and continue to receive the most press and media attention and are the group that are generally considered to be the most affected by these illnesses. 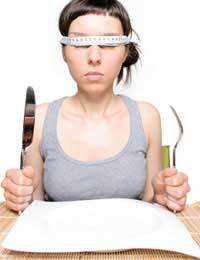 Eating disorders are illnesses in which the person becomes highly controlled over their behaviours towards food. This may show as a starvation period, bingeing followed by purging or bingeing episodes on their own. They are very dangerous and can be life-threatening in some cases and will usually need some medical and psychological assistance to overcome. The illnesses are not purely an attention seeking occurrence and have strong connections with deep rooted mental health, control and self-esteem issues. There are many signs that could be blamed on an eating disorder and each type of illness will display different behavioural traits; the most obvious ones are those relating to food and diet. Becoming obsessive about fat contents and calorific intake can often be the first signs of an eating disorder developing. The person may withdraw from family meals or tend to over-eat very quickly. Dramatic weight loss coupled with a desire to lose more is also a symptom of an eating disorder.Trying to hide food, disguise a smaller body under loose clothing or keeping a strict food diary can also be an indication. Excessive exercising is another way of losing weight, and this is even more dangerous when there is no food in the body and the body starts to use its own stores of muscle tissue to fuel the body. Low mood and self-esteem together with defensive behaviour when approached about their eating habits can also be warnings. Why Are Women Considered More Susceptible? Eating disorders are highly complex illnesses and each person will have their own reasons and causes as to why the illness has developed; they are not simply a way of attracting attention or manipulating loved ones as many people tended to believe in the past. The most obvious answer to this is because of body image, often blamed on the images portrayed in the press. Fashion magazines, television programmes and films all seem to promote a tiny frame and appearance as the norm. Many fashion designers have tried to defend these arguments but a lot of people feel that actions speak louder than words and when larger framed models are used to advertise the clothes, a range of actresses are used to play the lead characters in programmes or films and when the clothes are available in all sizes and not purely the tiniest ones, will women feel comfortable having a regular sized body, and not one that is dangerously underweight. It may be that the female has had bad past experiences and feels that by controlling their diet is a way of both punishing and rewarding their body and women have been found to have a stronger history of childhood abuse than males. Perhaps their life is simply too complicated and is so stressful that by taking complete charge of their diet they can have at least one area of their life that is not so out of control.There are many reasons why women may be more at risk than men of an eating disorder and these issues depend heavily on their age, background, self-esteem and the issues that are currently going on in life. Eating disorders are very serious illnesses and the consequences of not treating the causes can be very serious. Successful treatment of an eating disorder will often require input from both medical and psychological professionals.